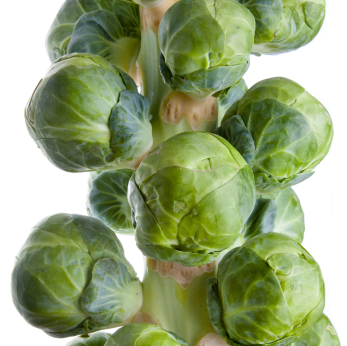 Brussels sprouts are a hardy vegetable that grows best in cool weather, when temperatures average 60-65°F (16-18°C). Brussels sprouts take a long time to mature, so plant in spring only if you live in a place with long, cool spring season. Plant seeds or transplants in the garden 12-14 weeks before the fall frost date. Provide shade if temperatures get very hot, and stake each plant if there is a lot of wind. Remove yellow leaves, leaving 2” (5cm) of the stem, to leave room for the sprouts to form. If you live in a mild climate with no fall frost date, you may be able to grow Brussels sprouts during the winter. Brussels sprouts grow best in a rich soil; amend with lots of compost and fertilizer (chemical or organic) at planting and twice during the season. Fertilizer: 16-16-8 at planting, 21-0-0 four and eight weeks later. Do not add fertilizer after sprouts begin to form. Harvest sprouts from the bottom to the top, when they are 1” (3cm) around and compact. Break or cut them off the plant. The sprouts will be sweeter after a light frost.